Clitheroe Castle Museum opened on 23 May 2009 following major restoration to the Keep and a complete refurbishment of the museum. The museum includes innovative interactive galleries, disabled facilities, a changing exhibition space, an education/meeting suite and a stunning glass entrance housing a souvenir retail space, reception and cafe/restaurant. See Lancashire Museums, Clitheroe Castle Museum to find more information about opening times, admissions, what's going on at the museum and for school and group visits. For enquiries about the museum please contact 01200 424568 or visit http://www.lancashire.gov.uk/leisure-and-culture/museums/clitheroe-castle-museum.aspx. Or for general enquiries about Clitheroe Castle please contact Ribble Valley Borough Council on 01200 425111. The Clitheroe Castle is surrounded by 16 acres of parkland. 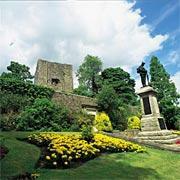 Clitheroe Castle and surrounding park in the centre of Clitheroe was bought in 1920 by the people of Clitheroe by subscription and declared a memorial to the men who had lost their lives in the Great War. Later a cenotaph was built in the newly created Garden of Remembrance and unveiled in 1923. Clitheroe Castle was built in 1186 by Robert de Lacy and has been a proud feature of the town ever since. The Castle Museum can be found next to the Castle Keep in the Castle Grounds.